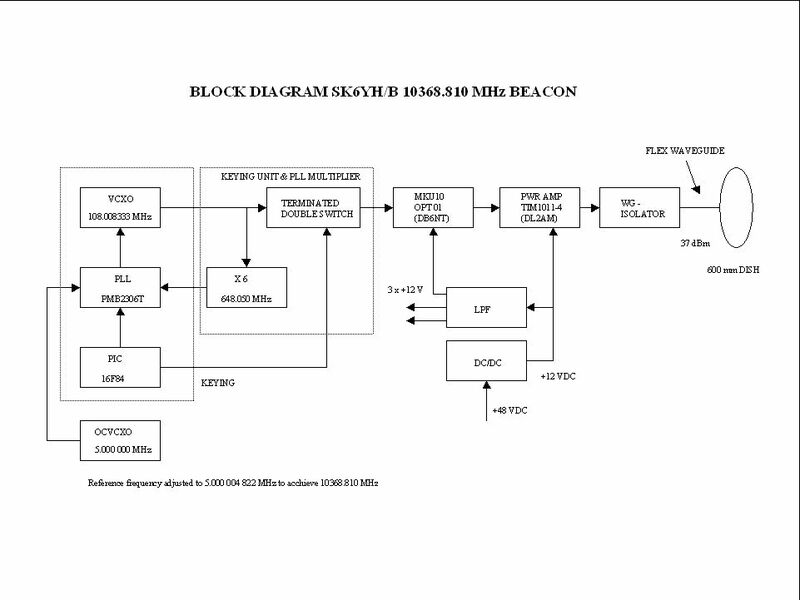 Beacon frequency is locked to a 5 MHz OCVCXO. Specification for the oven is +/- 2E-8 overall frequency stability over 1 year. This gives that the beacon frequency should not drift more than 207 Hz per year. Frequency has been adjusted to nominal 10368.810000 Hz in july 2002. The VCXO is an emitter harmonic oscillator with a capacitance diode from the xtal to ground. A PMB2306T from Infineon (Siemens)is used in the PLL-circuit. The PLL dividers are loaded from a PIC (16F84) at power on which then (the PIC) goes into beacon mode and generates the keying of the beacon. 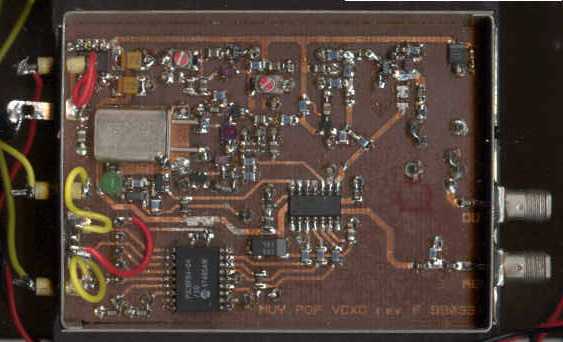 The output pwr from the VCXO box is approx 10 dBm at 108.0083333 MHz. The 108.008333 MHz signal is fed into the keying unit which consists of two GaAs SPDT switches with the unconected one port terminated in 50 ohm. This configuration gives the advantage that when keying is off - both the input to the multiplier chain and the output from the VCXO is terminated in a 50 ohm load minimizing the frequency pulling on the oscillator. The beacon multiplier by DB6NT has been slightly modified because it started to self oscillate 50 MHz below the beacon frequency when the input signal was in the off state. Some additional decoupling capacitors were needed. The signal from the beacon multiplier is fed into the DL2AM power amplifier. The amplifier consisits of a MGF2415 (Mitsubishi) driver stage and a TIM1011-4 (Toshiba) final stage. All beacon parts are fed with +12 VDC. The power amplifier has a 2A fuse and the voltage is filtered by 33uH/100uF. The other parts are fused by 1.6 A fuse and three separate filters (33uH/100uF). The three separate voltages are fed to the Ref osc, multiplier and VCXO/PLL/Keying unit. The 12V voltage is created by a DC/DC module from Lucent. This module can be fed with any voltage between 36 - 75 V. The module is fed with 48 VDC from a transformer, a simple rectifier and filter capacitors. The beacon antenna is a 600 mm dish which approximately have 33 dB of gain.